This story originally appeared in the Adirondack Explorer. Read more here. World-renowned stone sculptor John Van Alstine’s interpretation of nature’s interaction with the manmade world extends from his art to his home to his appreciation of the world around him. 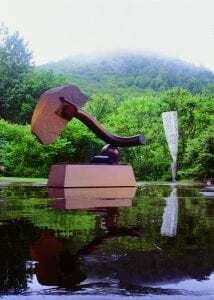 Large-scale abstract sculptures of found stone with steel and bronze surround and occupy many of the six buildings on his nine-acre complex — the former Adirondack Lumber Company mill along the Sacandaga River. » Continue Reading. 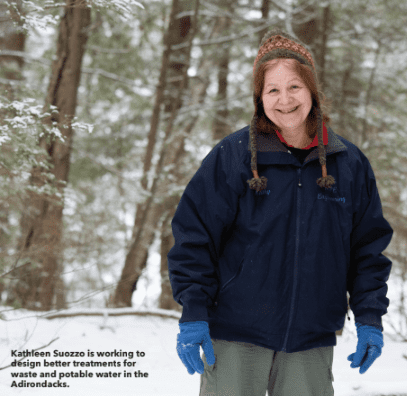 Kathleen Suozzo’s work is at the heart of one of the more difficult issues facing the Adirondacks today: upgrading aging waste-water and drinking-water treatment facilities in small communities where the cost is borne on the backs of local residents, though the heaviest usage is when tourists and seasonal residents come to visit. At stake are the lakes, rivers, and streams of the region. “After the summer tourists leave, we have infrastructure we need to maintain,” says Suozzo, an engineer who lives in Bolton Landing. She commends the people who work on skeleton crews managing the facilities and “just do what needs to be done.” » Continue Reading. 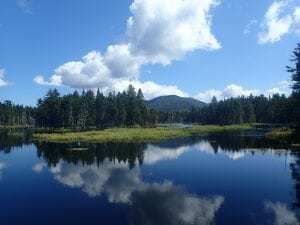 The Adirondack Explorer‘s next “Views of the Park” photo contest highlights towns, hamlets, and homesteads you love in the park. Post your photos on the theme “My Adirondack Town: photos from the place you call home – seasonally or year-round – in the Adirondacks” to Facebook and Instagram using the hashtag #adkexplorerpix. Explorer staff will choose their favorite photos to be included on the Adirondack Explorer website and highlighted in the bimonthly magazine. If yours is chosen, you’ll receive a free one-year subscription to the Explorer. Don’t worry, you don’t need to be a professional. Just get out your phone and snap a pic. Or send one from a previous year. » Continue Reading. 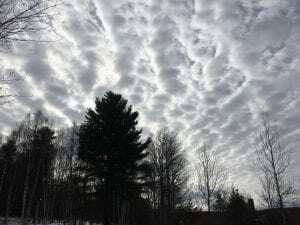 The Adirondack Explorer‘s next “Views of the Park” photo contest takes a look upward for dramatic sky photos. Post your photos to Facebook and Instagram using the hashtag #adkexplorerpix. Don’t worry, you don’t need to be a professional. Just get out your phone and snap a pic. Or send one from a previous year. We will post our favorite few photos to Facebook and let readers vote for a “People’s Choice” to be recognized in the magazine. And thank you to all who sent in photos for the last contest: “Winter views.” We loved them all so much it was hard to choose. Check out the final five winners. 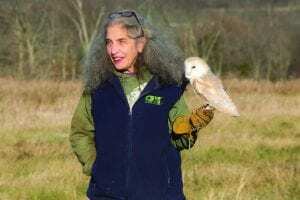 Somewhere around the age of five, growing up in Westchester County, Wendy Hall noticed that whenever the developers came in and clear-cut an area for construction, the wildlife would disappear. What was once a beautiful, wooded area quickly became developed after the addition of a train station, a story she has watched repeat itself many times. You can read about Wendy’s favorite place in the Adirondacks in the latest issue of Adirondack Explorer. “I would say man’s greatest assault to the ecosystem is his lack of patience,” Hall says. » Continue Reading. It’s January, time for a fresh, blank sheet on which to start our new year. Plenty of us are making renewed attempts at weight loss or looking to get better organized or at least vowing to break our addiction to twenty-four-hour cable news. Here at the Explorer, we’re renewing our hopes for smart decision-making in the Adirondacks and more chances to work together to ensure that the Park that we all love so much is protected for generations to come. Here are ten hopes we have for 2018. » Continue Reading. Just when we thought we were destined for another warm winter, we’ve gotten some snow — and ice. Perfect timing for the Adirondack Explorer’s next Views of the Park photo contest. 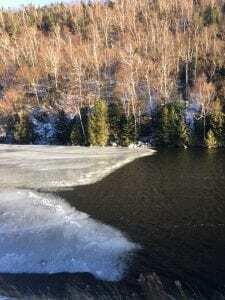 We’re looking for your photos of winter scenes in the Adirondacks. Post your photos to Facebook and Instagram using the hashtag #adkexplorerpix » Continue Reading. Storytelling — stories about Native American history as told by the people who lived it and not the abridged school textbook version — is part of Dave Kanietakeron Fadden’s makeup, his DNA. He is Mohawk. 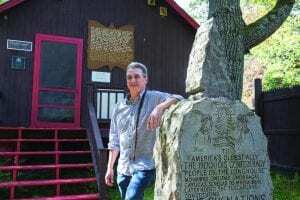 Though he’d never in his life addressed a group, Fadden went ahead and listed “storyteller” on his resume when applying for a position as an educator for the Iroquois Indian Museum in Howes Cave, NY, in 1993. He got the job, and his first talk was to a busload of sixty third-graders. » Continue Reading. 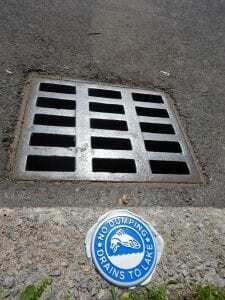 The Fund for Lake George has developed a low-impact development (LID) certification that, if widely adopted, could significantly reduce one of the greatest threats to water quality — storm-water runoff — by stopping it at its source. 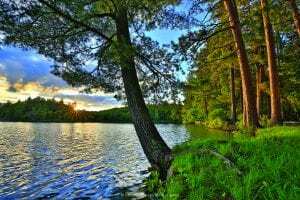 And in a region dependent on its three thousand lakes and ponds for their recreational value — and sometimes drinking water — that seems like a program we all should get behind. » Continue Reading. The Village of Lake George took a step forward in plans to replace its more than seventy year old wastewater treatment plant on Thursday with a $4,273,923 grant from the state. The grant was the largest of the $44 million in grants announced by Gov. Andrew Cuomo to support 24 essential drinking water- and wastewater-infrastructure projects. The village had already borrowed $1 million to begin designing a new plant, said Mayor Robert Blais. 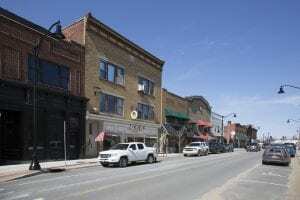 This grant will allow the village to reduce its borrowing. “We’re grateful the governor recognized the importance of Lake George and the village being able to construct an entirely new waste-treatment plant,” he said. » Continue Reading. 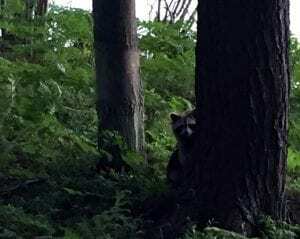 Last chance to submit your photos of wildlife encounters for the Adirondack Explorer’s next “Views of the Park” photo contest. We haven’t received many yet, perhaps because you think we’re looking for an elusive moose or a black bear. Think butterflies, snakes, chipmunks, birds. Deadline is 5 p.m. Monday. Explorer staff will choose their favorite photos to be included on the Adirondack Explorer website and highlighted in the bimonthly magazine. If yours is chosen, you’ll receive a free one-year subscription to the Explorer. » Continue Reading. Jen Kretser is featured as the “Trailblazer” in the September/October edition of the Adirondack Explorer. Read more about Jen in the issue, which you can get through the Adirondack Explorer app. Download it from iTunes or Google Play. Work on climate change is hard. And emotional, says Jen Kretser, director of programs for the Wild Center and project director for the Youth Climate Program run through the science museum. It’s devastating, for example, to watch a community in Sri Lanka affected by “crazy flooding” when they themselves produce no carbon emissions at all, she said. » Continue Reading. This November’s election may be an off-year, but it’s an important one for New Yorkers. The ballot will include the question of whether to hold a convention to make changes to the New York State Constitution, a chance that comes along once every twenty years. New York State residents with ties to the Adirondacks should be conflicted: on the one hand, their state constitution is in desperate need of revision — punctuated by a string of corruption convictions against state leaders in recent years. The changes needed to fix this problem aren’t likely to come from lawmakers themselves through constitutional amendment. 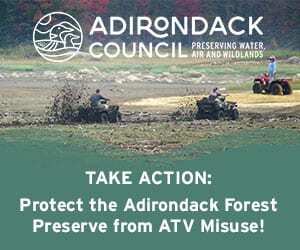 But while taking back control of our constitution seems a desirable goal, opening the potential for harm to Article 14, which includes the forever-wild clause protecting the Forest Preserve in the Adirondacks and Catskills, is a proposition scarier to some than politicians lining their pockets with public money. » Continue Reading. 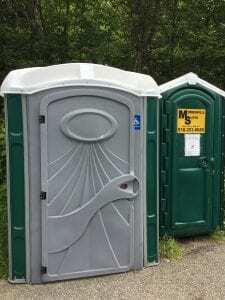 Great news: The Ausable River Porta-John program will continue. They reached their crowd-sourcing goal of $4,000 earlier this month to pay for handicap accessible Porta-Johns required by the state. More than 100 people supported the campaign. Now they’ve added another $1,000 stretch goal to pay for an initial round of E. coli and total coliform testing of 10 back-country sites this summer and fall, according to Brendan Wiltse, science & stewardship director for the Ausable River Association. » Continue Reading. As the season draws to a close, Lake George partner groups, including the Fund for Lake George, Lake George Waterkeeper Program and the Lake George Association, along with state and local governments, continue to search for the source of contamination to the lake water at Million Dollar Beach. The Department of Environmental Conservation closed the beach again recently after detecting bacterial contamination. 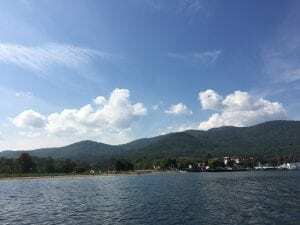 “Unfortunately, Lake George continues to be compromised through contamination from an apparent human source at Million Dollar Beach,” said Chris Navitsky, the Lake George Waterkeeper, in a press release issued by the Fund for Lake George. “While tracing the exact origin of the contamination is a complicated issue, we are confident this problem can be solved with a focused, science-driven plan of action.” » Continue Reading.